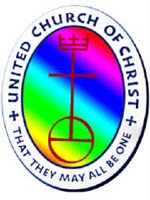 Here we will tell the story of the beginnings of our Church and how we became what we are today. 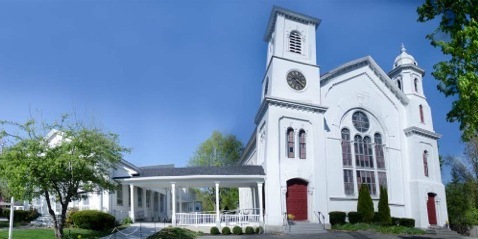 The original founders of the Belleville Congregational Church were first part of the Queen Anne's Episcopal Church of Newbury (Newburyport being part of Newbury at that time). 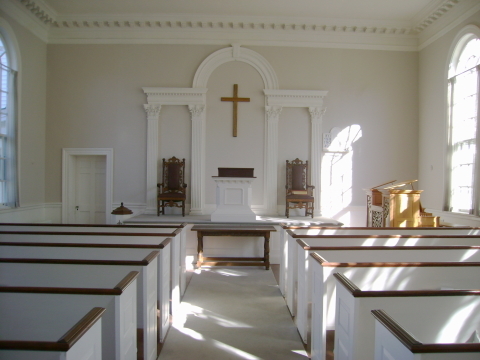 In June of 1761 a few members met at Queen Anne's Chapel, without permission to use the building, to discuss the organization of a Congregational Church. The minister, Rev. Edward Bass, in a letter dated June 9, 1761 protested this disorderly conduct to the governor of the province, whose recommendation that the members be granted the use of the chapel until they could erect a meeting-house. The original meeting-house was build on Meeting-House Lane, now Noble Street and on June 22, 1762, the Fifth Parish Church was organized. The Rev. Oliver Noble was the first minister of the church from September 1, 1762 and left following "some injudicious business discouragements" in 1784. During his tenure, the church was not prosperous and was not thriving. Following Rev. Noble's departure, religious services were continued without leadership of a minister and the congregation continued to decline. Before the nineteenth century, services were discontinued and the church had for all intent purposes closed it's doors. The neglected meeting-house that was erected in 1762 was completely destroyed during a violent storm in 1808. The preceeding year, 1807, a few individuals wanting to re-establish a Congregational Church, agreed to build a new meeting-house. The location was on the corner of High Street, near the corner of Woodland on land owned by Dr. Micajah Sawyer. The meeting-house was dedicated on November 24, 1807. "The Proprietors of a New Meeting House in the Fourth Parish in Newbury" was incorporated by a special act of legislature which passed on March 4, 1808. The Rev. James Miltimore was the first minister on served form 1808 - 1836. The second Meeting-House at the new location was destroyed by fire, having been hit by lightening on April 1, 1816. A third Meeting-House was built and dedicated November 7, 1816. "Know all men, to whom these presents shall come. I was born in the year----, in London, England, was soon after transported to this country and presented to Queen Anne's Chapel in Newbury, state of Massachussetts, (as my label shows) by the lord bishop of London. After remaining quietly in the blefrynof said chapel for many years I was taken by force and secretly buried. After the lapse of a few yearsI reappeared and was placed in the belfry of a schoolhouse in this vicinity. Soon after I was taken down and placed in the belfry of this church, where I called together the congregation for many years --- but in the year 1838 I was taken down to make room for a larger personage --- in a few moments after reaching the ground I was stolen --- by whom no one knows ---and placed in the belfry of the same school house now in another street, where I remained until last Saturday evening when I received a call from some friends, which I gladly accepted, and have treated me so well and placed me where you now find me. Restore me to my lawful owners or beware!" After the death of Rev. Miltimore, the Rev. John C. Marsh who had served as assistant pastor, became the minister until his death September 26, 1846. Rev. Daniel T. Fiske was installed August 18, 1847. 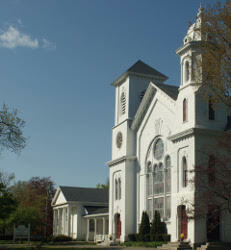 In 1851, with the parish being annexed to Newburyport, the name of the church changed to "The Belleville Congregational Church and Society of Newburyport". January 8, 1867 the third Meeting-house was again totally destroyed by fire caused by arson. Between 1862 and 1866 numerous properties were hit by arson, including several other churches. In 1869, Leonard Choate was tried, convicted and sentenced to imprisonment for life for the arson . A fourth meeting-house was erected and dedicated December 24, 1867. This fourth meeting-house (3rd on site) has a pipe organ which was built by William Stevens (1808-1896) of East Cambridge, MA. In the 1820's, two brothers from Norway, Maine, George and William Stevens were apprenticed to the organ builders, William and Eben Goodrich and Thomas Appleton of Boston. In 1855, William Stevens formed his own business, Stevens and Jewett and later was renamed to the Williams Stevens Organ Company. At one time there was several organs in Newburyport by William Stevens. The organ at St. Paul's is one that still exists in its' original condition. Our organ was installed at a cost of $4,965. The organ was dedicated on December 18, 1867. After Dr. Fiske, Rev. Willis A. Hadley was installed on November 30, 1887 and resigned June 1, 1891. He was succeeded by Re. Albert w. Hitchcock who was pastor from December 15, 1891 through December 8, 1900. He was followed by the Rev. Richard Wright from 1901 - 1907. He was followed by the Rev. Frank N. Merriam from 1907 - 1924. He was then followed by the Rev. George W. Hilton, 1924 - 1928, who was followed by the Rev. J. William L. Graham from 1928 - 1943. Rev. Graham was followed by the Rev. Stanley Anderson from 1943 - 1949, who was then followed by the Rev. Donald J. MacCallum from 1950 - 1958. After Rev. MacCallum, the Rev. David VanStrien was pastor from 1958 - 1969. He was followed by Rev. E. George Hangen from 1970 - 1998. Rev. Hangen was followed by Rev. Ross Varney in 2001 to present. Last updated on: March 30th, 2019. Website by Line by Line web design.